Our beautiful beachfront bach is a slice of kiwi heaven! 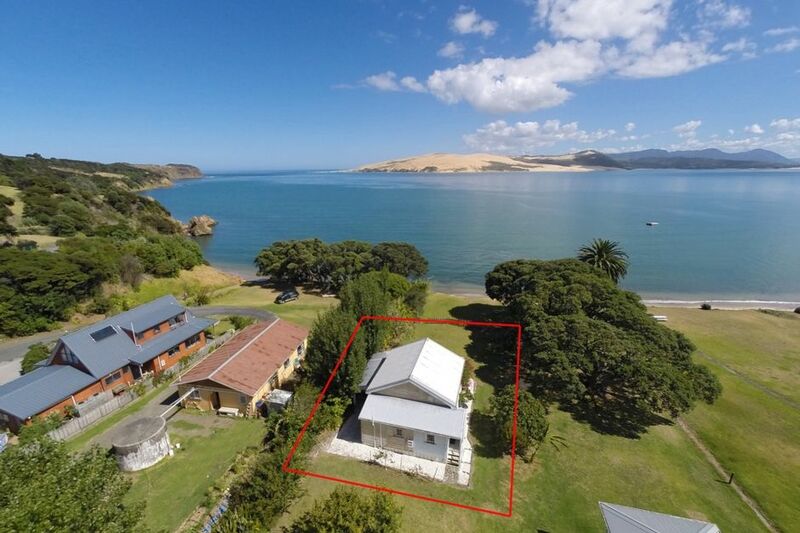 Positioned direct beachfront with a long lawn sweeping down to the white sand you will enjoy wonderful views of the Hokianga harbour. Charming character and European inspired interiors provide simple beachfront living with polished kauri floorboards, European shutters and a big verandah perfect for a quiet drink watching the sun go down at the end of the day. We eat all our meals out here most of the year. A simple original kitchen provides all the amenities you require and is stocked with food basics. There are two bedrooms within the main home, one with a new good quality queen bed and the second has two singles with room for a single air bed (supplied) to accommodate 3 children. Our garden chalet was built recently, is basic sleeping accommodation and can accommodation 2 to 4 additional guests (please enquire for details, it has power but no plumbing at this stage). Due to the steepness of the ladder to the loft this is not ideal for young children. There is a single garage where the kayaks are stored and big lawns. We are a couple of doors along from the Copthorne hotel so perfect for family groups attending weddings etc. Swimming outside our house is superb plus we have two kayaks for your use or you can fish from the beach or the wharf. We are the only bach at this sheltered end of the beach which has its own private garden and is genuine beachfront. There are a number of activities to enjoy in the surrounding area. We would recommend visitors try the night Kauri forest tours, Rawene with it galleries and great cafe or catch the car ferry to Kohu Kohu for the historic walk or lunch at the excellent cafe. Direct waterfront and the beach is not fenced. Elevated deck, no child gate on steps. Step from the front lawn onto the sand. Sae swimming beach. Al basic items provided. Please replace items you finish. Two kayaks with life jackets. Not provided but launching facilities in Omapere and Opinoni. You can anchor outside the Bach. Definitely the most charming of the BnB offerings we researched in the area. Such a beautiful old house. We forgave a few maintenance issues, but for this to be a truly great bach those need to be addressed. Great bed linens! And a sense of generosity was in evidence. Watch out for the regular Saturday night weddings at the nearby Copthorne hotel during summer - amazing level of music noise until midnight on the Saturday we stayed. Enchanting little historic bach right on the beach. We had the most wonderful time exploring Omapere, and the Hokianga Harbour, as a family from this beautiful little bach which has been lovingly decorated in vintage style. We immediately felt relaxed and comfortable. Our children loved playing on the beach right in front of the bach and the view across the natural harbour to the sand dunes is incredible. There are plenty of adventures to be had nearby including Tane Mahuta, Boogie boarding the sand dunes and a dip in the Mermaid Pools. A beautiful and historic part of New Zealand to explore. Thank you. Great location and nicely appointed. Giving it four stars because maintenance was not up to par. Thank you for your kind review Kate. We are so pleased you enjoyed your holiday, we would love to have you back some time. Easy direct access to sheltered sandy shoreline with breathe taking panoramic coastal views. Easy direct access to sheltered sandy shoreline with breathe taking panoramic coastal views. Great to come home to the charm of a bygone era and nostalgia. Thank you Victoria for sharing your happy place with others. Omapere is a small beachfront village with an excellent wharf , boat launching facilities and lovely swimming beaches. The Copthorne resort hotel is a couple of doors from our Bach and this has a bar, beautiful outdoor garden bars and a very good restaurant. there is small locally owned cafe by the service station. the local diary/foodmart and service station are both well stocked. A few minutes up the road is Opononi which has large shopping, cafe, restaurants, wharf and boat trips across to the sand dunes.